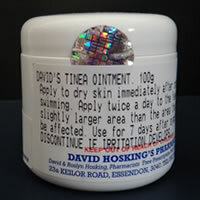 Please note that David’s Tinea Cream is not suitable for use by children under 12 years old. David’s Tinea Cream contains 3 different antifungal ingredients, all of which are different to the typical antifungals purchased over-the-counter from other pharmacies. This means that our tinea cream can work against resistant fungal infections and can be effective even when common anti-fungal creams have not been successful. Do this by applying David's Tinea Cream twice a day. Apply it to dry feet just before bed and just before putting on footwear in the morning. Increase in foot comfort and reduction in itching will be noticed within 24 hours. Treating footwear is necessary to kill any fungal spores that could reinfect you with tinea. This is best done by spraying the inside of the shoes with Deo Fresh. Use once each night for one week as needed. Prevent reinfection from wet areas in your house. This is simply done by splashing a cupful of White King or similar chlorine bleach around your bath or shower recess and leaving overnight to kill any bacteria and fungi in the bathing areas. This can simply be treated by applying David's Tinea Cream twice a day until all signs of rash have gone. If the treated area becomes irritated shortly after applying the cream, simply wash it off and reapply the next day. Slowly build up the amount of time you leave the cream on the skin until you are able to apply twice a day without washing off. As with treatment for Tinea Corporis, Jock Itch can be treated by applying David's Tinea Cream twice a day until all signs of rash have gone. Itchy groin rashes like Jock Itch (tinea cruris) are often fungal in nature and respond very well to treatment with David's Tinea Cream. We have occasionally found that Jock Itch is very tender when the Tinea Cream is applied so initially only only a small amount (about enough to cover a fingernail) should be applied just at night. If irritation occurs, wash off with water and reapply the next night. Slowly build up the amount of time you leave the cream on the skin until you are able to apply twice a day. As the rash becomes controlled the skin will become less irritated and the product will not sting as much.